by Shakespeare in LA in Fundraiser, Los Angeles Tags: Independent Shakespeare Co.
Join Independent Shakespeare Co. for a special concert to benefit the Griffith Park Free Shakespeare Festival Sunday May 19 from 3:00 – 5:00 pm. 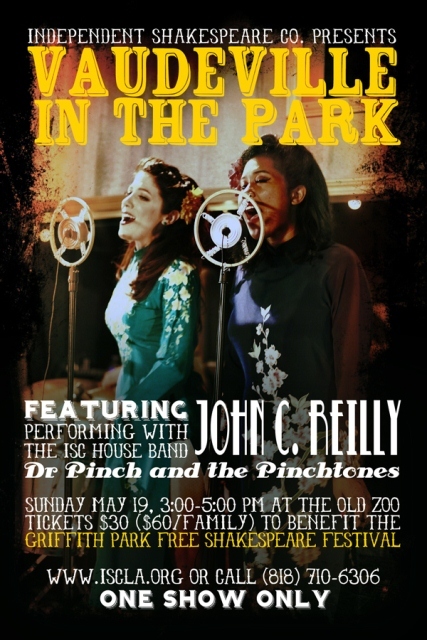 The show will feature special guest John C. Reilly performing with Dr. Pinch and the Pinchtones (from last summer’s Comedy of Errors). Come one, come all for an afternoon of Shakespeare, comedy, and vaudevillian entertainment! Individual tickets are $30 and family tickets are $60 (2 adults bringing 2 or more children). For location details and more information, go to www.iscla.org.